In the Offing | Kappa Kappa Kappa, Inc.
Born in Decatur, Illinois, in 1938, Rob O'Dell studied commercial art at the American Academy of Art in Chicago. He was a layout artist in Chicago until 1969. 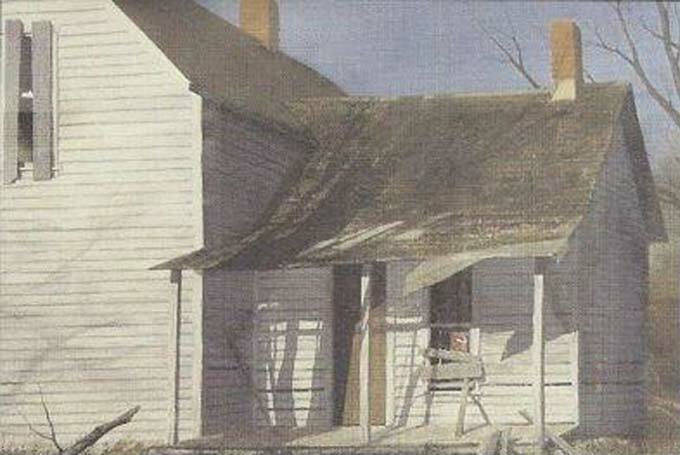 He then moved to Sugartree Farm in Ladoga, Indiana to paint full time. The mood of his painting is often one of loneliness, and while nature and the objects of man's creation appear repeatedly, man himself is conspicuously absent from the scene. Through the artists keen insight, he seems to have the power to intensify our vision. From the Tri Kappa Art Collection housed at Rose-Hulman Institute in Terre Haute, Indiana.